German physician; born at Bonn Nov. 11, 1795; died at Elberfeld March 5, 1851. He took an active part in the campaigns of 1812, 1813, 1814, and 1815 as an officer in the middle-Rhenish army, fighting at first with, and later against, Napoleon. 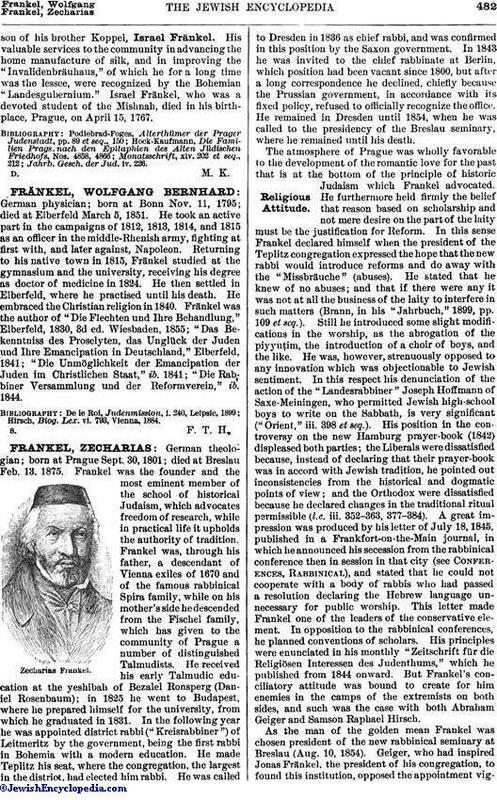 Returning to his native town in 1815, Fränkel studied at the gymnasium and the university, receiving his degree as doctor of medicine in 1824. He then settled in Elberfeld, where he practised until his death. He embraced the Christian religion in 1840. Fränkel was the author of "Die Flechten und Ihre Behandlung," Elberfeld, 1830, 3d ed. Wiesbaden, 1855; "Das Bekenntniss des Proselyten, das Unglück der Juden und Ihre Emancipation in Deutschland," Elberfeld, 1841; "Die Unmöglichkeit der Emancipation der Juden im Christlichen Staat," ib. 1841; "Die Rabbiner Versammlung und der Reformverein," ib. 1844. Hirsch, Biog. Lex. vi. 793, Vienna, 1884.